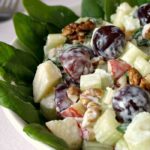 Best Waldorf Salad Recipe with celery, apples, spinach, grapes and walnuts, amazingly fresh and crunchy. It has a homemade salad dressing made of light Greek yogurt and a bit of mayo, and a good drizzle of lemon juice. 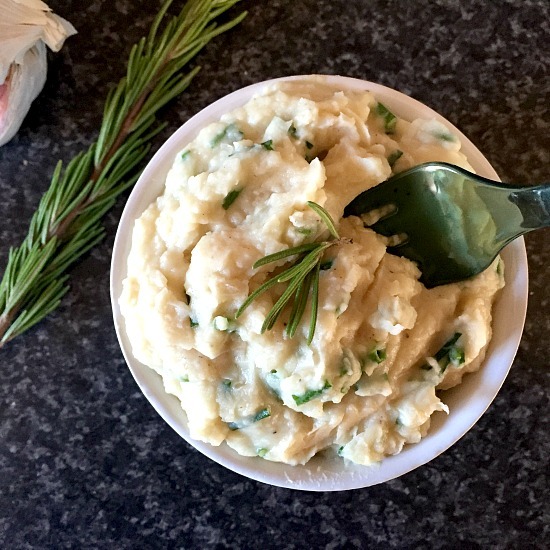 The perfect recipe when you want something quick and easy. With Christmas and Boxing Day truly over, we have a tiny break before the New Year to rest from all those mince pies, roasts and booze. If you can’t possible see turkey in front of your eyes anymore, but would much rather try something lighter, this Waldorf salad is the answer. 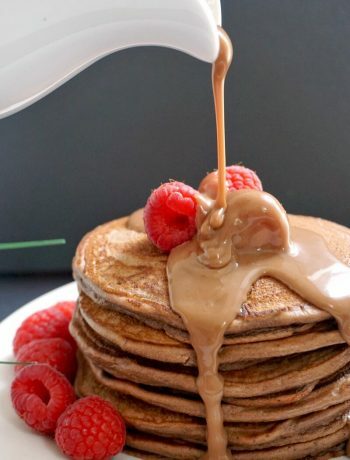 It might not cure a bad hangover, but it can certainly help detox from those heavy gargantuan meals. Now, don’t expect to lose all the extra weight you might have put on these days in a go only, better take it easy and enjoy, there’s more to come soon. I do love a good salad, although, you know me, l wouldn’t just eat leaves, that’s not food. Throw some other ingredients in, and you can count on me. If you’d like to make it a bit more filling, you can added cooked chicken to it, or any other leftover meat from your dinner. 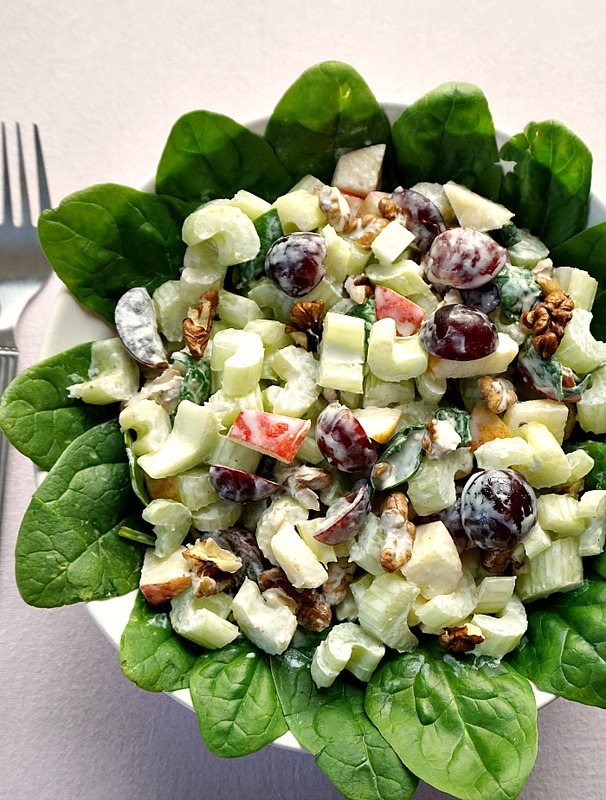 There are a few variations of the Waldorf salad, and you’ll probably find that most recipes call for lettuce, rather than fresh spinach. What is Waldorf Salad made of? 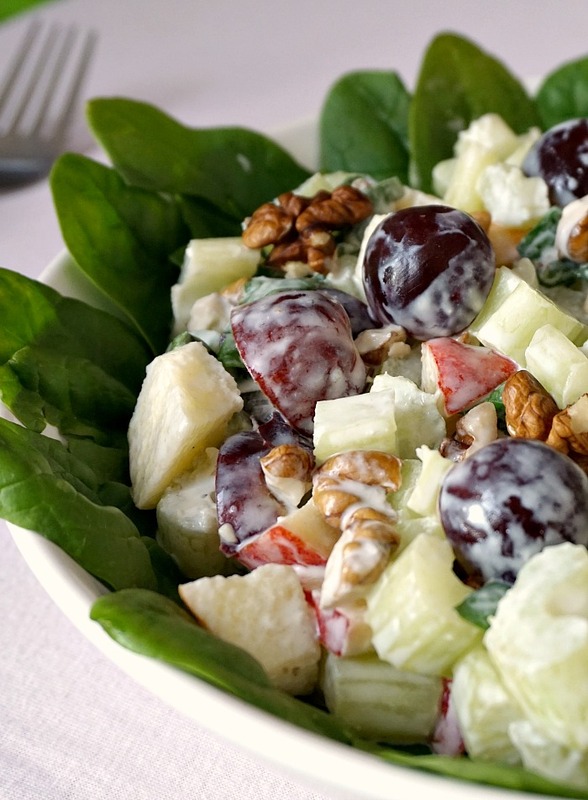 Originally, Waldorf salad was made only of apples, celery and mayonnaise, and later on nuts were added too. Nowadays, grapes and lettuce are common ingredients in the salad too. Although I don’t say no to mayo, I think it’s a bit too heavy for my liking to use only that as a dressing. Hence why I added Greek yogurt too, and a good drizzle of lemon juice. If you cut the apples in advance, the lemon juice keeps them fresh, otherwise, they turn brown pretty quickly. I used spinach instead of lettuce, I’m usually a spinach girl, but you can totally use lettuce for this recipe. Orthers nuts can used too along with the walnuts, pecans and almonds would be a particularly good choice. If you like your salads more filling, try adding cooked chicken pieces, it can only make it even tastier. Absolutely, especially if it’s not drenched in heaps of mayo. If you are worried about your calorie intake, you can omit mayonnaise altogether, and use yogurt only. It will still be as delicious, and a lot healthier. I usually go for Greek yogurt, it’s creamy, silky, and its thicker texture binds the salad ingredients together a lot better. All in all, it’s a lovely salad that l so much enjoyed, worth giving it a go. As with any salads, it’s best to serve it as soon as possible. 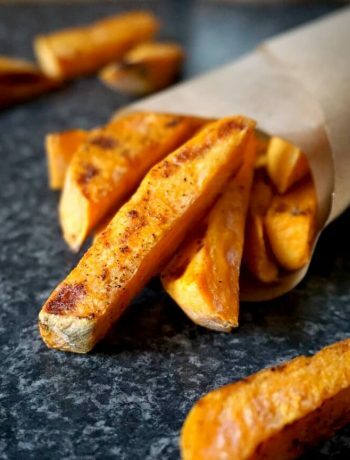 But if you want to prepare it in advance, l would just cut up the ingredients and drizzle some lemon juice over to keep fresh, and only add the dressing when you are ready to eat it. Looking for another lovely salad? How about my Healthy Mediterranean Chickpea Salad with Feta? Equally delicious, and as healthy. If you’ve tried my BEST WALDORF SALAD RECIPE or any other recipe on the blog then don’t forget to rate the recipe and let me know how you got on in the comments below, I love hearing from you! You can also FOLLOW ME on FACEBOOK, and PINTEREST to see more delicious food and what I’m getting up to. 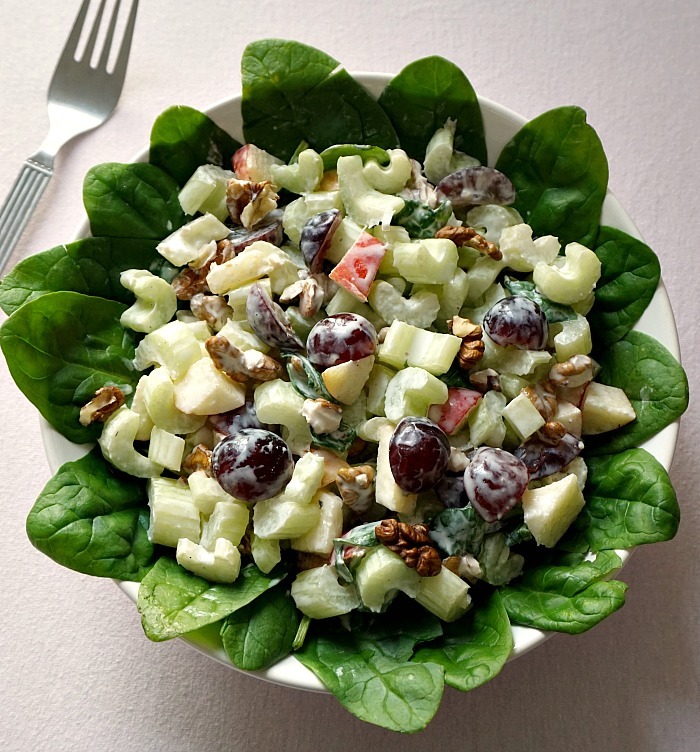 Healthy Waldorf Salad with celery, apples, spinach, grapes and walnuts, amazingly fresh and crunchy, with a light Greek yogurt and mayo dressing, and a good drizzle of lemon juice. Wash, core and chop the apples in chunks. Chop a few spinach leaves and cut the celery stalks and grapes, then add them all to a bowl together with the walnuts. Drizzle the lemon juice over, add yogurt and mayonnaise and combine well. Arrange spinach leaves on a plate, then top with the salad. Thank you, Ronit! I really liked it too. I love a good Waldorf salad. And I’m with you on not wanting just leaves. I need some substance to my salads. This salad looks awesome! Thank you, Elaine! Happy you like it! ? What a perfect salad, will give it a go as it looks really yummy!! Thank you, Martyn! I hope you enjoy it! I never really knew what a Waldorf Salad was! I would love to try and make this food allergy friendly. I am sure you will love it, the salad is very light and tasty. I haven’t had Waldorf Salad for so long. Reminds me of my childhood. Thanks for sharing this! Thank you for your comment, it’s a very nice salad, l’ll definitely make it again.